Forgetting or losing administrator password will prevent use of your password protected laptop. This problem can be resolved by using a bootable PCUnlocker CD that will help you unlock password protected laptop by resetting the admin password. Save yourself the headache of fighting to get back into your computer! This method is fast and easy! Just download the PCUnlocker software, burn it to a CD, insert the CD into the password protected laptop and all the current passwords will be removed so you can get back into Windows and get to work. How to Unlock Password Protected Laptop? First you need to make a PCUnlocker CD using another computer. Once you’ve downloaded the zipped ISO image of PCUnlocker, unzip the download file and you’ll get the pcunlocker.iso file. Burn the ISO image to CD using ISO2Disc program. Place your PCUnlocker CD in the CD-ROM of your password protected laptop. Power on the machine and set CD/DVD-ROM as the first boot device in BIOS, so your laptop should boot into the CD drive instead of your normal operating system. Once booting from the PCUnlocker CD, it will load the WinPE operating system and finally start the PCUnlocker program itself. The program detects your Windows installations and displays a list of Windows user accounts. Choose a user account and click on “Reset Password” button. It will unlock your user account and remove the forgotten password immediately. Reboot the machine and remove the PCUnlocker CD. You can then get into Windows without a password! You’ve successfully unlocked a password protected laptop. I am running Windows 7 64-bit Professional, and have two user accounts on my computer. Problem is that the login screen only shows the last logged in user and an “Other User” icon which allows you to input username manually. Is there any way of reverting to showing a list of all the users instead? 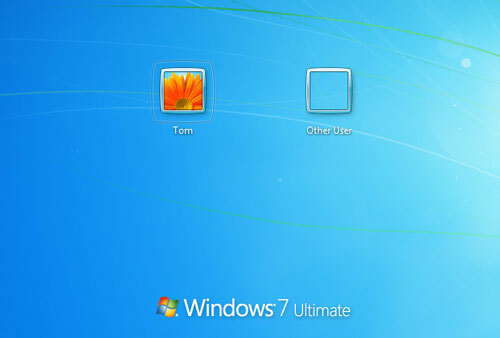 If you have multiple user accounts in Windows 8, 7 or Vista, you may notice a new annoyance – The login screen only displays the last logged-on user and a blank image with the label “Other User”. When the latter is clicked, two text fields will appear prompting for username and password. Here we’ll show you how to fix this problem so you can see a list of users at the login screen. 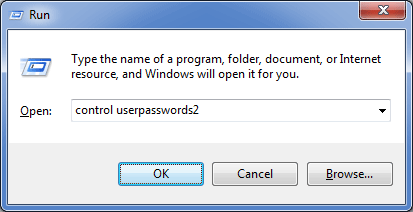 This method will also prevent Windows from automatically logging in to the last user account. How to Fix Windows Login Screen Showing Only Last Logged-on User? Press Windows + R key combination to bring up the Run box. type netplwiz and press Enter. If this isn’t functioning, type control userpasswords2. This will take you to the same place. 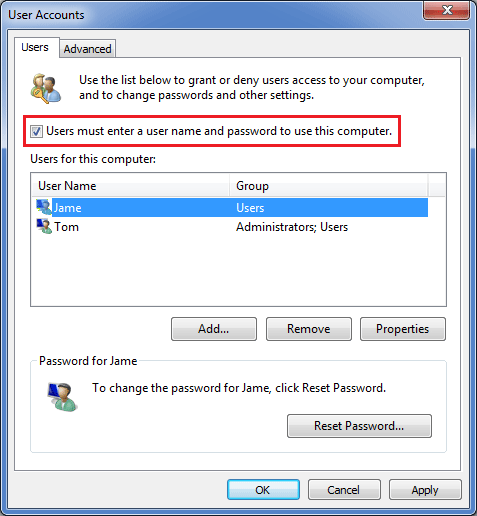 Once in the user accounts window, check the box labeled “Users must enter a user name and password to use this computer”. Click OK. Restart your computer and see if the login screen is now back to normal again with all user icons displayed. Note: You must be logged in as an administrator to be able to do the steps in this tutorial. If you can’t remember the administrator password, you can reset it using PCUnlocker Live CD or USB drive. I have Windows XP Media Center. Unfortunately I disabled the user account (which I think might have been the admin account) for the log on to Windows and can no longer get past the log on screen. Is there anyway to re-enable that account so I can access my computer again? Have you disabled the Windows administrator account and can’t log on to your computer? Need to enable the the built-in administrator account for troubleshooting purposes? There are many situations that we need to enable or activate Windows administrator account without logging in. Here is an easy fix. How to Enable or Activate Windows Administrator Account without Logging In? First of all, you need to create a PCUnlocker Boot CD using another computer. Download and install Password Recovery Bundle on the computer. Launch the program and click on “Windows Password” button, it will display a new window which enables you to create a PCUnlocker Boot CD easily. Put the PCUnlocker Boot CD in the optical drive of the locked computer that you’re trying to gain access to. Set your optical drive as the first boot device in BIOS. Start the computer and it will boot from PCUnlocker Boot CD then. After a while, the program inside the Boot CD will launch. It automatically finds all Windows user accounts on your system, and display user account properties for each user: Locked Out, Disabled and Never Expire. Choose your administrator account that is disabled, and then click on “Reset Password” button. The program will enable the administrator account and also remove the password. Restart the computer and remove the PCUnlocker Boot CD. You can then start your computer and log back in to your administrator account with a blank password. So that is how can you enable / activate Windows administrator account without logging in. It’s very useful when you’re unable to log on your computer, or you can only log in with Guest account but don’t have administrator privileges. 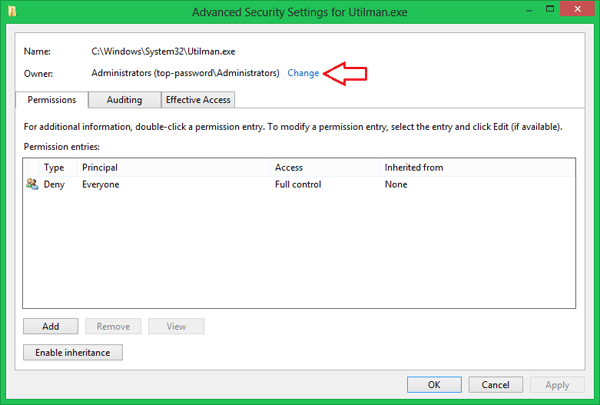 If you can log in to Windows with administrator privileges, then you can enable / disable Windows administrator account easily from Command Prompt. 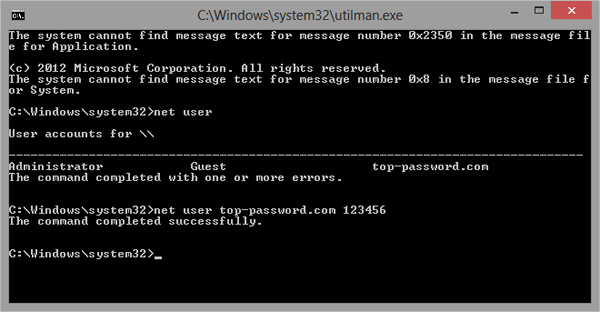 Forgetting your Windows 2003 password is not really something that happens too often, but it can happen. This is especially true if you are administering several computers that all are protected with difficult-to-remember passwords. Years ago this may have been a serious issue and could have resulted in formatting the hard drive, but these days it’s not too much of a problem. In this article we’ll walk you through how to recover Windows 2003 password with PCUnlocker. If you don’t have a PCUnlocker Live CD, you can create on using another computer. Boot up your locked PC from PCUnlocker Live CD and it enables you to recover passwords for both local administrator and domain administrator on Windows 2003. How to Recover Windows 2003 Password with PCUnlocker? First of all, you need to create a PCUnlocker Live CD using another computer. Click here to download PCUnlocker and save it on the computer. Once downloaded, extract the ISO file from the ZIP file. Burn the ISO image file to a CD using ISO2Disc, BurnCDCC, ImgBurn or other burning software. After burning the PCUnlocker ISO image to disc, go to the Windows 2003 computer that you’re trying to gain access to. Insert the PCUnlocker Live CD into your CD/DVD drive and then restart the computer. You’ll probably need to make changes to the boot order in BIOS in order to get the computer to boot from PCUnlocker Live CD. PCUnlocker program will start once the boot process is complete. It automatically locates the local user accounts on your Windows 2003 system by default. If you want to recover a lost domain password, you need to click on the “Reset Active Directory Password” option and it will then display your Active Directory user accounts. Select a user account and click on “Reset Password” button. The program will unlock / reset your lost Windows 2003 password in seconds. Restart the computer and take out PCUnlocker Live CD from the CD/DVD drive. Now when you boot the machine the password for that user should be gone! How safe is Windows 8 Microsoft account? Should I use a Microsoft account or local account? Can I log in to Windows 8 Microsoft account without Internet connection? How to unlock my computer if I forgot Microsoft account password? In this article we’re going to explore all the secrets of Windows 8 Microsoft account. Is Microsoft Account Password Locally Cached in Windows 8? When you successfully log in to Windows 8 with a Microsoft account, the logon credentials of your Microsoft account are cached locally on your computer. If you then disconnect that computer from the network and try to log on, Windows will authenticate your password locally using the cached credentials. The main advantage of a cached logon credentials is that users can also log on to their computer without Internet connection. When the Registry Editor opens, navigate to HKEY_LOCAL_MACHINE\SAM. By default, this subkey appears as empty. To expand this subkey, right-click on the SAM key and select Permissions, this will open the Permissions dialog for that subkey. Click the Administrators group and grant Full Control privileges. Expand the SAM subkey and navigate to the subkey: HKEY_LOCAL_MACHINE\SAM\SAM\Domains\Account\Users\000003E9. Here 000003E9 is the RID of my Microsoft account and it may be different in your side. On the right panel, you can find the CachedLogonInfo value, which stores the login credentials of your Microsoft account. But you can’t see the clear-text password because it is encrypted. How Long Does Windows Cache Microsoft Account Password? The cached logon credentials will never expire itself. If you change your Microsoft account password online via https://login.live.com, the cached logon credentials won’t update until you successfully log in to Windows 8 with the new password. After you have successfully logged in to Windows 8 with the new password, you cached logon credentials are updated. However, after changing your Microsoft account password online, if you never use the new password to log in to Windows 8, the cached logon credentials are not updated, even if your computer has Internet connection. In such situation, you can still log in to Windows 8 using your old password. The system will always check your password against the cached logon credentials firstly. If it doesn’t match, it then checks your password online when your computer has Internet connection. Is It Secure to Use Microsoft Account to Log in to Windows 8? The cached logon credentials is the last logged-on password used for your Microsoft account. It is a significant security risk. If your computer ends up in the wrong hands, an attacker can run a brute force attack to find out the local cached Microsoft account password. However, there is not any password cracking software out there which can support this type of account, that is because Microsoft account is a completely new thing to users, and Microsoft account password is encrypted using much stronger encryption algorithms than local user account password. To reduce the security risk, it’s better to use a strong Microsoft account password. It’s also recommended to log in to your Microsoft account online and set up the security information, including alternate email addresses, your phone numbers, security questions and trusted PCs. This can help you reclaim your account when your Microsoft account is hacked. 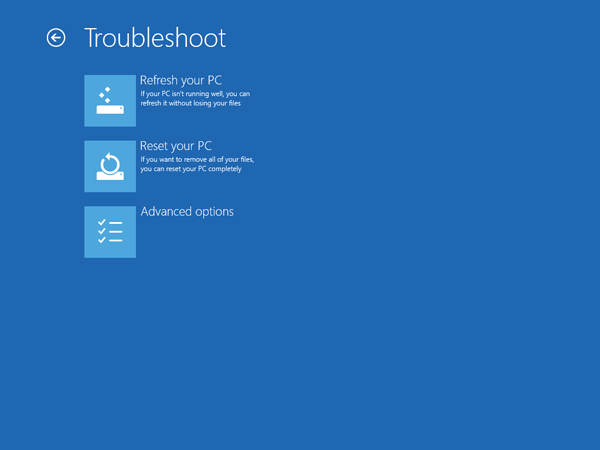 How to Log in to Windows 8 After Forgetting Microsoft Account Password? What to do if you forgot your Microsoft account password? The easiest way is to reset your password online via Microsoft’s website, but it requires you to provide the security information that is associated with your Microsoft account. If you’re unable to verify the security information, you can also access your computer by replacing the cached logon credentials of your Microsoft account. PCUnlocker is a powerful Windows password reset utility which can run from a bootable CD or USB drive. After booting from PCUnlocker Live CD/USB drive, simply choose the local user account which is linked to your Microsoft account, and then click on “Reset Password”. The program will replace the cached logon credentials on your local computer, so you can then log back into Windows 8 with a new password. I have forgotten the local administrator password of Windows 2008. That is the only account and I can’t login now. There are critical data on the server that we can’t afford to lose. How can I recover Windows 2008 password? Nowadays we have so many passwords to remember, it wouldn’t be surprising if you forget your password every once in a while. So what to do if you forgot Windows 2008 local administrator password? With PCUnlocker Live CD you can recover lost or forgotten Windows 2008 local administrator password easily. How to Recover Windows 2008 Local Administrator Password? After burning the PCUnlocker ISO image to disc, go to the Windows 2008 computer that you’re trying to gain access to. Insert the PCUnlocker Live CD into your CD/DVD drive and then restart the computer. You’ll probably need to make changes to the boot order in BIOS in order to get the computer to boot from PCUnlocker Live CD. PCUnlocker program will start once the boot process is complete. It automatically locates the Windows SAM registry file which contains the encrypted user account information, and displays a list of local user accounts existing on your Windows 2008 system. Select the local administrator account and click on “Reset Password” button. The program will remove your Windows 2008 local administrator password in seconds. Restart the computer and take out PCUnlocker Live CD from the CD/DVD drive. When Windows logon screen appears, you can log into the local administrator account without a password! 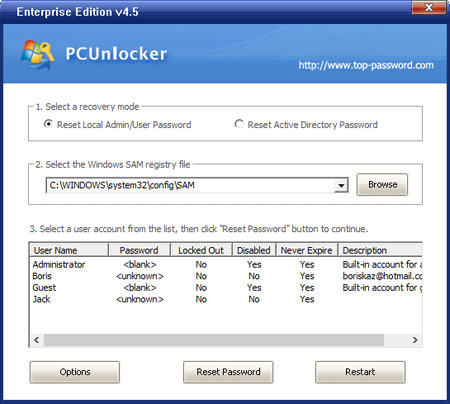 Besides recovering Windows 2008 local administrator password, PCUnlocker could also be used to recover local administrator passwords on Windows 8, 7, Vista and XP. It supports both 32-bit and 64-bit Windows operating systems. One of the changes in Windows 8 that draws the most attention is the sign-in options. Windows 8 allows you to log on using Microsoft account, four-digit PIN and picture password, as alternate sign-in options for conventional text password. However, I discover that the Account Lockout policy is not working for the new sign-in options. I set the number of logon attempts before locking the system, and specify the Account Lockout duration using the Local Security Policy Editor in Windows 8. After enabling the account lockout policy, restart the system. When it boots to the Windows 8 logon screen, I try several wrong passwords with my Microsoft account intentionally, Windows keeps saying password is incorrect but never lock my Microsoft account, and I can then immediately log into the system using a correct password. The same thing happens with PIN code and picture password. I think this is a great security hole or bug with Windows 8 operating system. Account Lockout policy is designed to disable a user account if an incorrect password is entered a specified number of times over a specified period. It help you to prevent attackers from guessing users’ passwords, and they decrease the likelihood of successful attacks on your network. So I think it’s more secure to use a traditional text password than using the new sign-in options: Microsoft account, four-digit PIN and picture password. If you’ve ever pressed the Shift key five times in quick succession, intentionally or accidentally, you’ve no doubt seen the Sticky Keys dialog box. 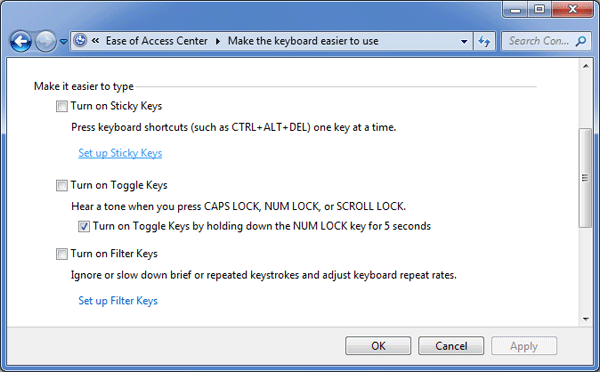 Sticky Keys is designed for people who have difficulty holding down two or more keys simultaneously. Suppose you want to launch Windows Explorer via the keyboard shortcut. Normally that means holding down the Windows key and tapping E. After enabling Sticky Keys, you can open Windows Explorer by pressing Windows key, releasing it and then pressing E. You don’t have to press two keys simultaneously. However, the Sticky Keys dialog box can be a minor annoyance to users who do not need them. It also opens up a security hole which lets unauthorized users to access your computer by resetting Windows 7 password using Sticky Keys trick. 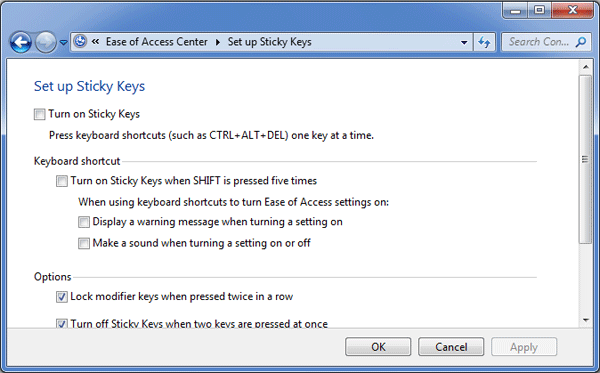 In this article we’ll show you how to disable the Sticky Keys features in Windows 8, 7 and Vista. How to Disable the Sticky Keys in Windows 8/7/Vista? Open the Control Panel. Under View by, choose the Small icons to view a list of all Control Panel items. 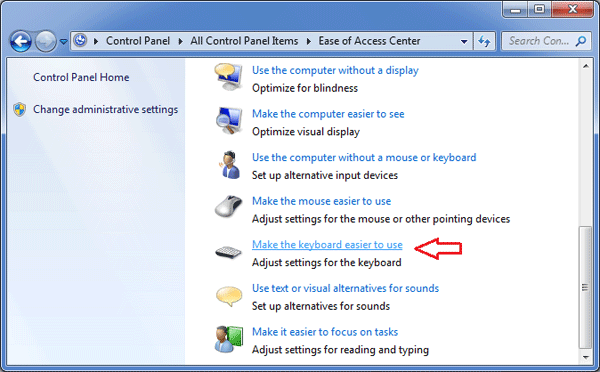 Click the Ease of Access Center item and click the link Make the keyboard easier to use. Once you are there, uncheck the Turn on Sticky Keys option. But that does not prevent Windows from asking if you want to turn on the features if you happen to press the Shift key five times. To turn off the dialog box and thus relieve the annoyance, you will have to dig a bit deeper. Click on the Set Up Sticky Keys link to reach the configuration screen. On this screen, you want to uncheck the Turn on Sticky Keys when SHIFT is pressed five times box. That will prevent Windows from asking if you want to turn the feature on. Click OK button to save your changes, and you should no longer see the Sticky Keys popup warning you that the feature has detected your key presses and decided to activate itself. If you have been using Windows 8, you may have noticed the small Ease of Access button on the bottom left corner of Windows logon screen. This button allows you quickly access Ease of Access features such as narrator, magnifier, high contrast, on-screen keyboard right from the logon screen. 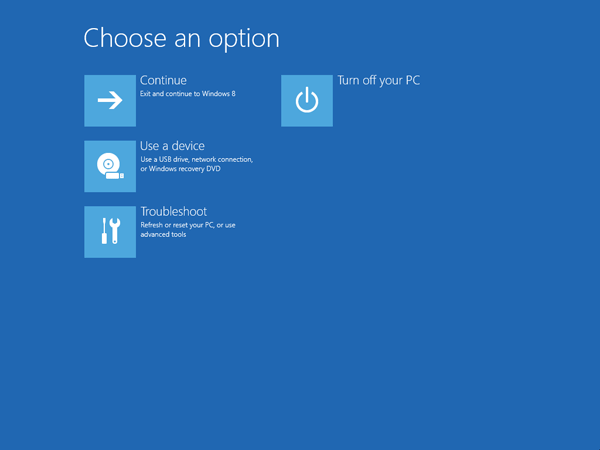 In this tutorial we’ll show you how to disable the Ease of Access button in Windows 8 logon screen. 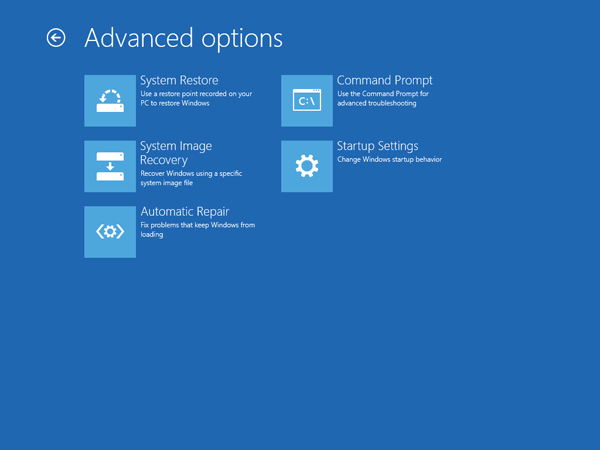 How to Disable Ease of Access Button in Windows 8 Logon Screen? Press Windows + X key combination to bring up the Power User menu, and then click/tap on Command Prompt (Admin) option. It will open up the Command Prompt immediately. Enter the following command and press Enter. This will modify the ACL on the utilman.exe file so everyone doesn’t have permission to execute this program. You will be prompted with a Y/N just type Y and hit Enter and close the Command Prompt. If you receive the “Access Denied” error, you need to change the owner of Utilman.exe from Trustedinstaller to Administrators before running the command above. Tips: If you don’t know how to change the owner, please refer to this article: How to Take Ownership & Grant Full Control Permissions to Files & Folder in Windows 8/7/Vista. After disabling the Ease of Access button, log off your user account. Now you’ll get nothing anytime you click on the Ease of Access button from Windows 8 logon screen.